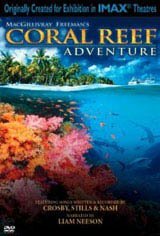 Coral Reef Adventure follows the real-life expedition of ocean explorers and underwater filmmakers Howard and Michele Hall. Using large-format cameras, the Halls guide us to the islands and sun-drenched waters of the South Pacific to document the health and beauty of coral reefs. Featuring songs written and recorded by Crosby, Stills & Nash. Narrated by Liam Neeson.